Tanks and soldiers are seen purportedly near Deraa, where mass protests were taking place on Sunday, in this still image taken from amateur video footage uploaded to social networking websites on April 24, (Reuters). Syrian army units have begun withdrawing from Daraa, a military source said on Thursday, even as soldiers stormed areas across the country arresting hundreds in an attempt to crush a six-week-old pro-democracy uprising. President Bashar al-Assad, facing the most serious challenge to his 11-year authoritarian rule, had ordered the army 10 days ago to enter Daraa, where demonstrations calling for more freedoms and later for his overthrow started in March. Activists and residents said soldiers, backed by tanks, had shelled and machine-gunned the old quarter of the city and rounded people up in mass arrests. The state news agency SANA quoted an official military source as saying the army had completed its mission, arresting elements of terrorist groups and restoring "security, peace and stability". Two witnesses who were heading out of the city told Reuters that around 30 tanks on armoured carriers had left the city heading north. 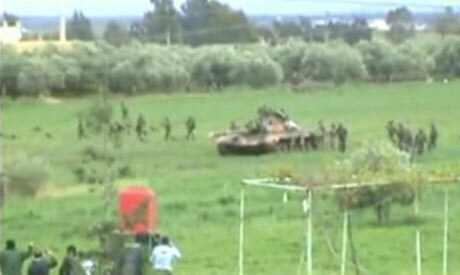 They said Syrian army units backed with armour remained deployed at several entrances to the city. Elsewhere, residents said soldiers had made arrests in the Damascus suburb of Saqba and tightened sieges on two defiant urban centres ahead of the Muslim day of prayer on Friday. Muslim prayer is the only time Syrians are permitted to gather legally, and hence the day of the biggest demonstrations. A female resident, who did not want to be identified, told Reuters that hundreds of soldiers in combat gear had broken into houses and made arrests overnight in Saqba, where thousands had demanded Assad's overthrow last week. "They cut off communications before they came in. There is no resistance. The demonstrations in Saqba have been peaceful. Scores of people have been arrested," she said. Wissam Tarif, executive director of the Insan human rights group, said at least 260 people had been detained in Saqba. He earlier told Reuters more than 800 people had been rounded up in Daraa since the army moved in. In a sign that Assad was further widening the use of the military to crush demonstrations against his autocratic rule, tanks and armoured vehicles deployed around the town of Rastan, and army units set up checkpoints in Sunni districts in Banias. Armed troops also deployed in the Damascus suburb of Erbin and in the town of Tel, north of the capital, where security forces arrested at least 80 men, women and children, the human rights organisation Sawasiah said. "Five men over 70 years old were arrested. No one is escaping beatings and insults. Two mothers were taken as hostages because security forces could not find their sons," Sawasiah said in a statement on the arrests in Tel. Rights groups say the army, security forces and gunmen loyal to Assad have killed at least 560 civilians since the protests erupted in Daraa on March 18. Officials give a much lower death toll and say half those killed have been soldiers or police. Before the army division led by Assad's brother Maher stormed Daraa, Assad had relied mainly on other security forces and secret police to confront the mass demonstrations. "Assad's decision to use the army is pretty much the utmost escalation of force he can muster and a clear signal that he has no interest in any reconciliation," said an Arab government official monitoring the situation in Syria. Washington, which had been rehabilitating its ties with Assad in recent years, has gradually intensified its condemnation of the violence in Syria, most recently calling the army's assault in Daraa "barbaric". Italian Foreign Minister Franco Frattini said on Thursday that Washington and Rome had discussed sanctions against the Syrian government for its suppression of unrest, including suspending cooperation talks with the European Union. Last week, the United States imposed sanctions against leading Syrian figures including relatives of Assad, and the EU agreed in principle to impose an arms embargo. Assad belongs to the Alawite sect, an offshoot of Shi'a Islam in a country where the majority are Sunnis. His father Hafez ruled Syria for 30 years, and was succeeded on his death by Bashar. The elder Assad extended Alawite control of the army, which is now led by mostly Alawite officers and effectively controlled by Maher al-Assad, military experts say. The army and pervasive security apparatus underpin the power structure in Syria, fulcrum of several Middle Eastern conflicts. The ruling hierarchy has an anti-Israel alliance with Iran, but has kept the Golan Heights frontier with the Jewish state quiet since a ceasefire brokered by the United States in 1974.